A piece of me was lost in the hurricane. It was not a hand or foot, arm or leg, but my heart string to the past. That wind and water never knew how it would affect so many people not to mention me and my mother. Hurricane Katrina affected the entire Gulf Coast of the southern United States. My mom, being a retired teacher, resided on the coast of Biloxi, Mississippi. She had plenty of time to go inland, but none of her belongings and my own inheritance, could ever fit in her small car. She waited out the storm at a friend's house while her entire home, literally seashore property, was being beaten down to nothing but a 2 x 4 and a candlestick. The home and all the surrounding others were destroyed in August 2005. What I had in my inheritance belongs only in my memories: a few mementos of school days, a senior portrait of me enlarged beyond modesty brightly lit by a spot light. Tightly away in the outside storage shed, however, were several old 60s dolls, one including my Chatty Cathy. She was a blonde with blue eyes. I did not remember her well and neither did I need her. Along with blankets and typical storage items, she was lost to the sea (or located in someone's back yard inland!). After the realization that I would never see anything of my past, including Chatty, including my great grandmother's Limoges cocoa pot, I started going to auctions in my own area of the country, the Midwest. It was fun to get lots of items for little or nothing. Paying a dollar for a large box is comparable to buying a grab bag. Once, I spotted a doll that resembled my Chatty Cathy. I don't recall what she was, but I then realized that I had an opportunity to replace my lost doll with someone else's. So I began with fervor like nothing ever in my life. never to speak, write or communicate in any form while attending college. This was a very scary thing to do as this school was known for high-stress among the student body and suicide rates are very high. So when there was no communication from my first born, my baby girl for so many years, when I started searching for dolls, something inside of me started to become filled inside from the loss of my own daughter. She would go for years without any communication and we had no idea where she lived. Certainly the school would help us but because of the privacy laws, we had no rights! Dolls filled my home. Everything from composition of the 20s, 30s and 40s starting pouring in, filling my shelves, imploring my husband who thought me nuts to be purchasing and cherishing dolls when I never had an interest in all my life until age 45! I was a raving, obsessed woman. Little dolls, big dolls, scrappy dolls, pristine dolls. All kinds, mostly vinyl, mostly play dolls, rarely the bisque or the sit high on the shelf dolls. These dolls completed the hole in my heart. The string to my heart was being tied and starting to blossom into a wonderful exciting hobby. Although the collection is not complete the realization that a real live human will never be replaced by a doll that cannot hold you back, give you kiss and tell you how much they missed you all these years. But I do hold the hope that when that day arrives, these dolls will secretly beam from within and know they did they part in healing me. I have the faith it will happen, just like I know after the storm there will be calm. My dollies complete my heart for now, even to this day, without my Dani Rose in my life. I know she is alive but has nothing to do with me her dad or her younger brother. There is no explanation. It just is. All the while my dolls fill the rooms and I have learned to heal and restore them! 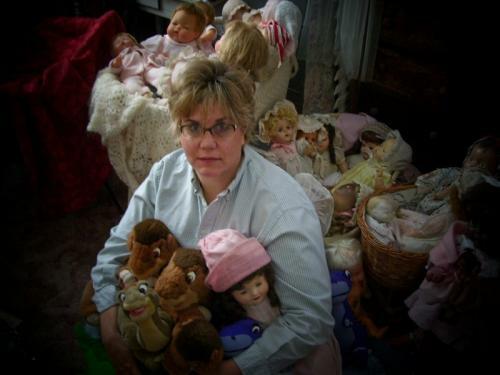 I have seven Chatty Cathy dolls and ca-zillions of others. They need help, like me. We are a family. It's just wonderful.